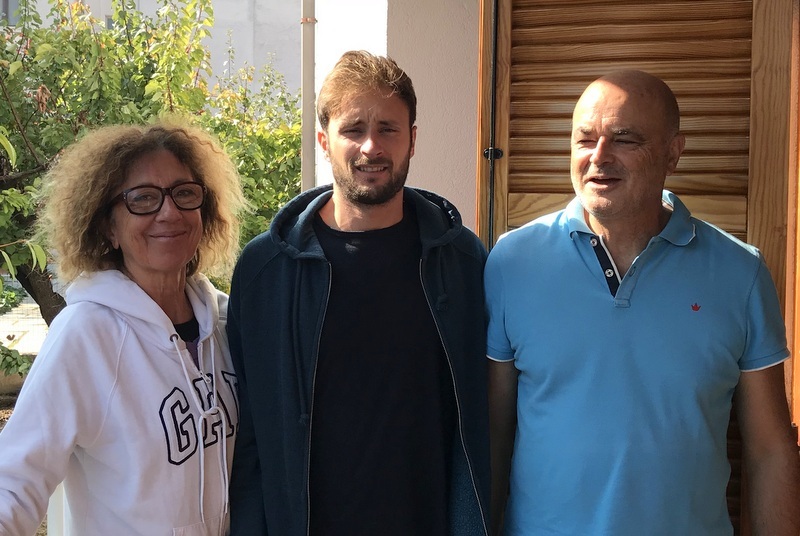 I have friends in Giulianova, in Abruzzo and decided to visit them on a weekend. It’s a relatively inexpensive (20 euros each way) 3 1/2 hour train ride from Bologna. I took some traditional Bolognese pastries as a gift and arrived on Friday evening. Aurelia picked me up at the train station and took me to their house and then we walked into town to do some shopping. I mention this mostly because at her favorite macelleria (butcher shop) the woman behind the counter who probably operates the place with her husband said that they were in New York on 9/11/2001. They had been planning to go to the twin towers that morning but fortunately were behind schedule when the attack occurred. Small world. Bologna traditional pastries as a gift for Paolo and Aurelia. 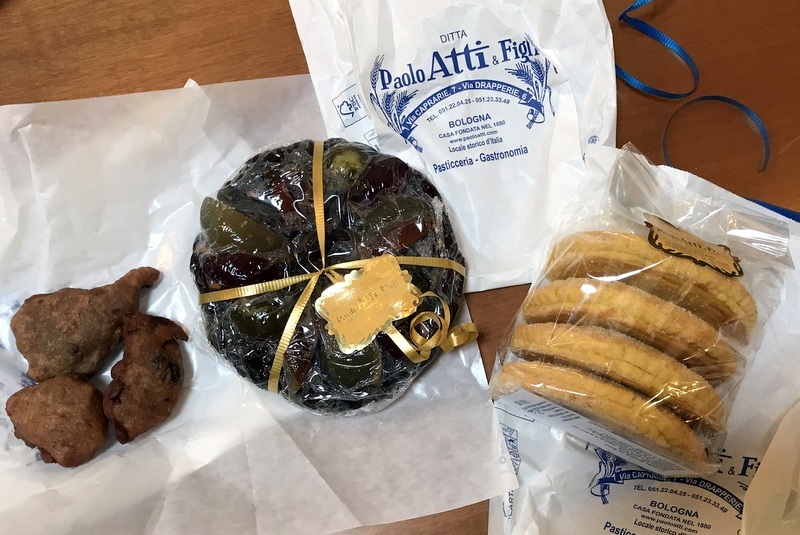 Actually the chestnut fritters on the left were for me and didn’t make to Abruzzo. 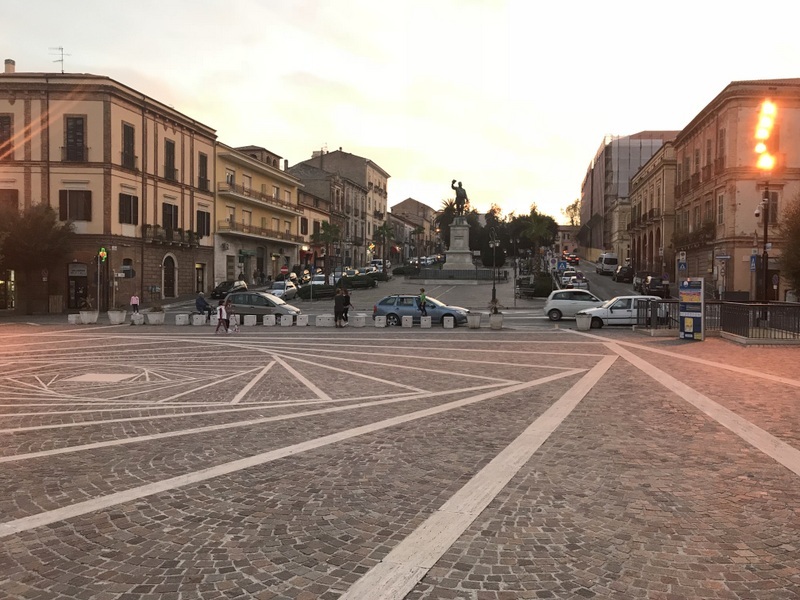 The major Piazza in Giulianova at sunset. The next morning I walked around town taking some photos of anything that I found interesting and bought some flower for Aurelia. 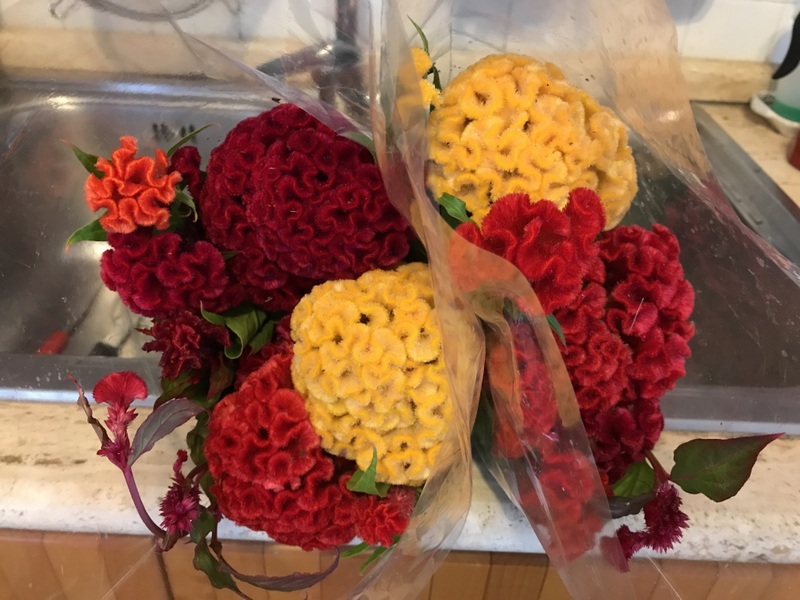 I have never seen flowers that looked like brain coral before and Aurelia said that they dry well so it was a good choice. 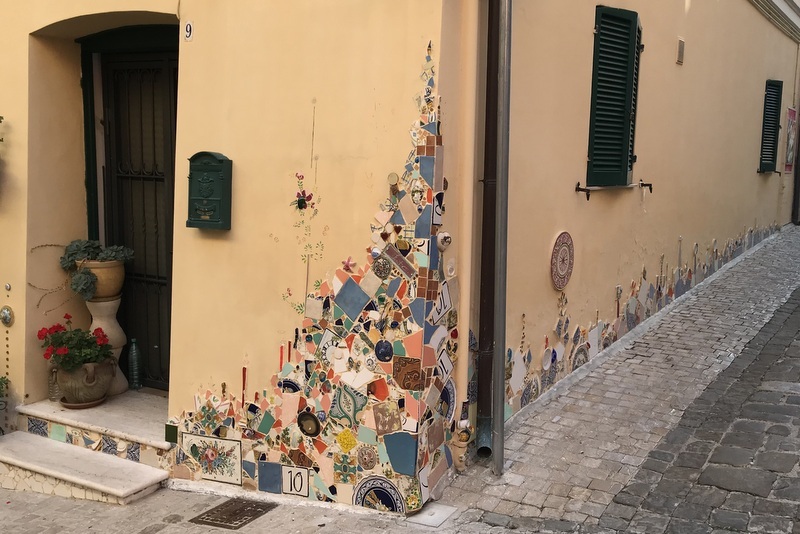 Decoration of a house in Giulianova – perhaps an artist lives there. 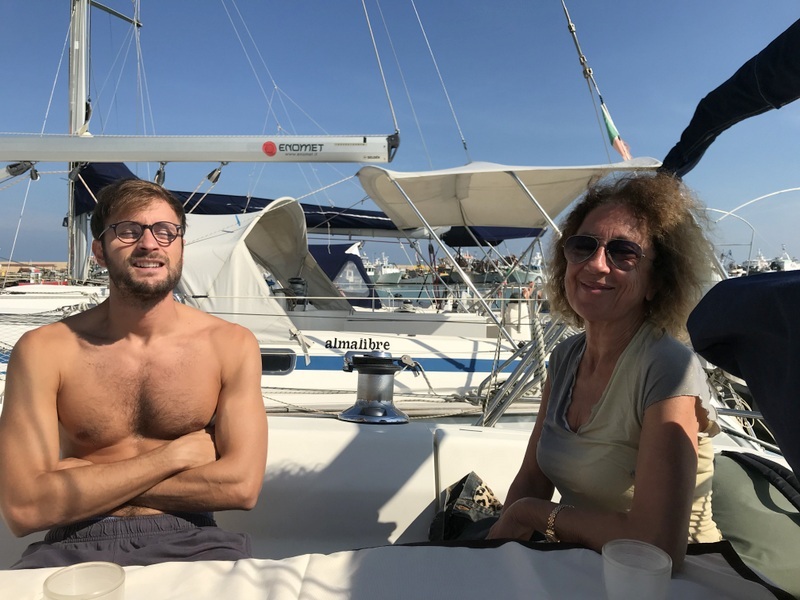 The special event of the day was an outing on the boat that her husband Paolo owns with a partner, Marco. 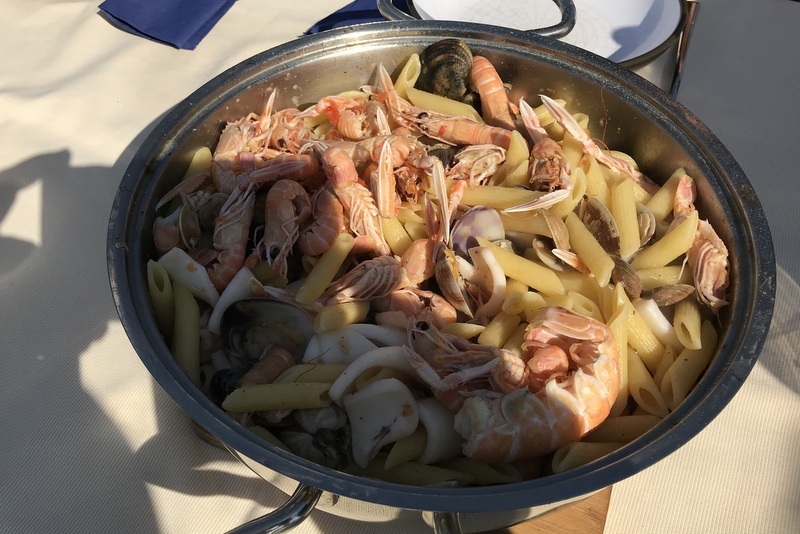 Paolo cooked penne with assorted seafood (clams, little bitty scampi, shrimp and cuttlefish). Aurelia says that it’s the only thing that he knows how to cook and does it, oh, 3 or 4 times a year. 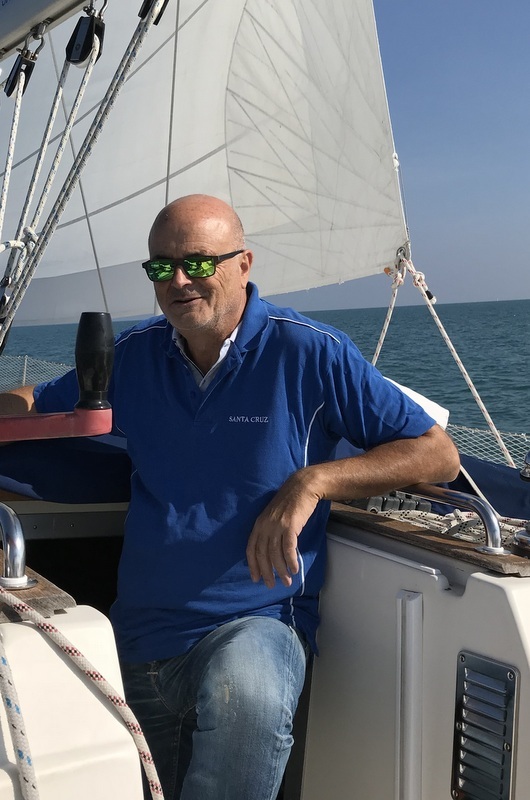 Then I went out for about a 2 hour sailing excursion with just Paolo and Marco. 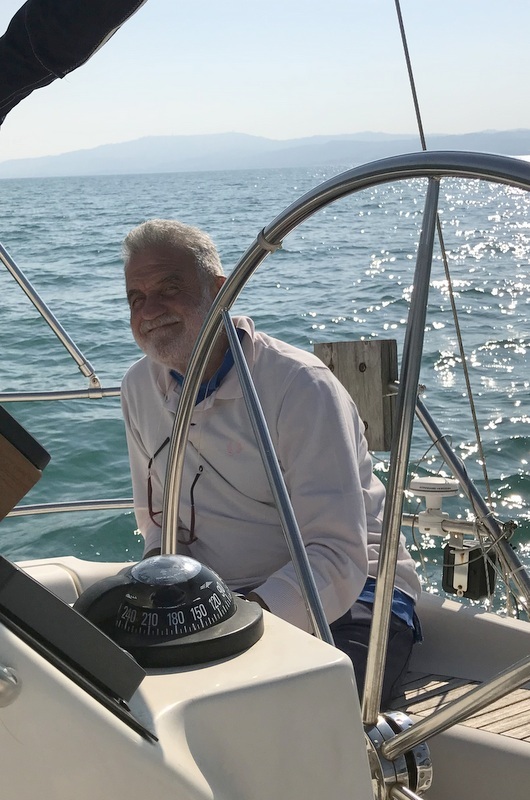 I’ve really only been on one sail boat before – a 30 foot one on Chesapeake Bay about 45 years ago. This one was considerably bigger at 46 feet. That extra 16 feet makes a lot of difference. 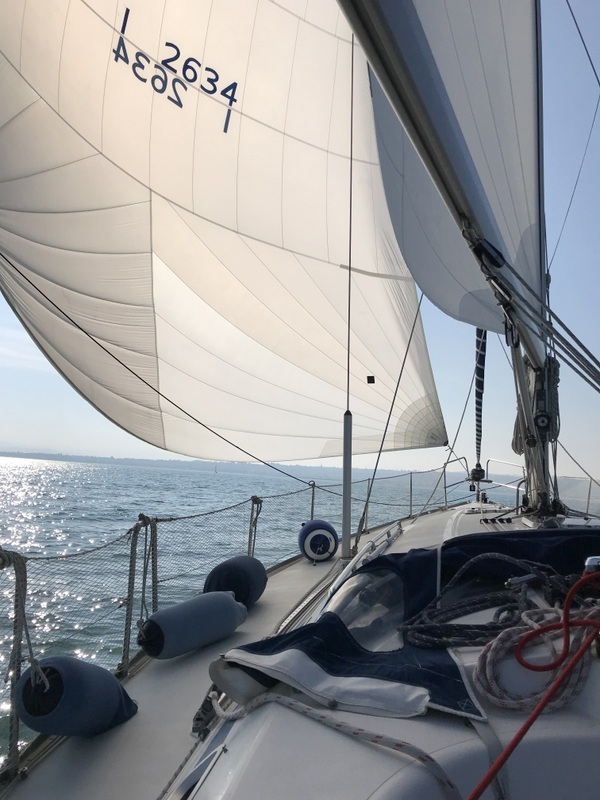 I was simply a passenger who watched with amazement the occasional frenetic activity followed by a fairly long boring period of just letting the wind do it’s work. Seems like a lot of work for such a trip. 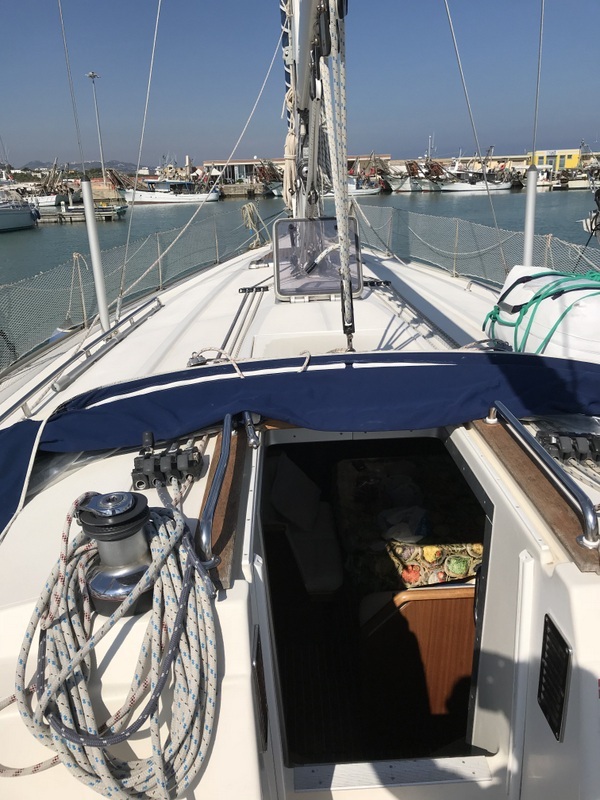 Paolo said that it takes 14-16 hours to sail from Giulianova to Croatia so that’s probably about 13 1/2 to 15 1/2 hours of really not much to do other than go with the flow. 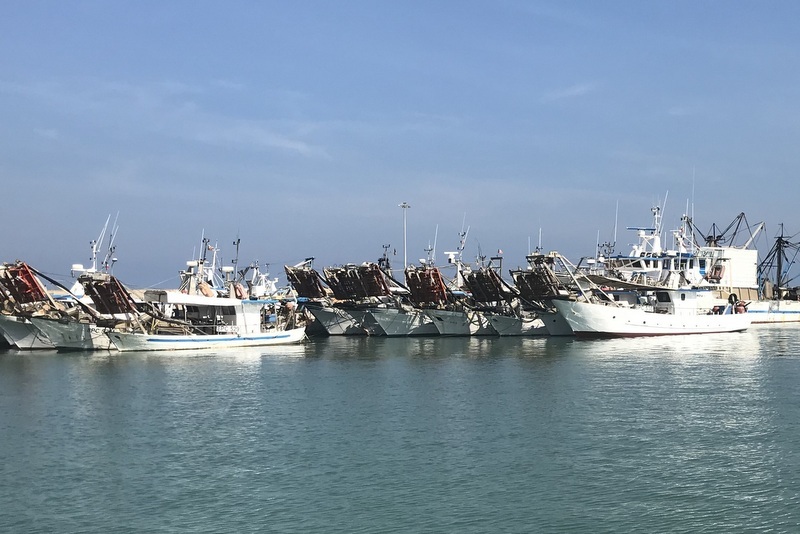 One of the things that surprised me was the number of serious looking fishing boats. 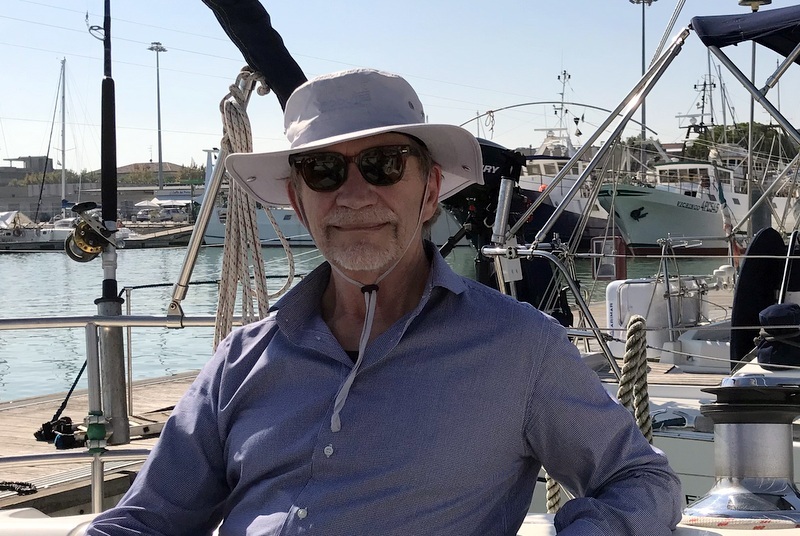 I knew that the city is a seaside resort packed with people in the summer but had no idea that it must haul a heck of a lot of fish out of the Adriatic sea. I’d like to spend a day on one of those some day to watch the action – probably like sailing a lot of slack time punctuated by frantic activity. This entry was posted on Tuesday, October 24th, 2017 at 7:38 am	and is filed under Culture, Food, Travel. You can follow any responses to this entry through the RSS 2.0 feed. You can leave a response, or trackback from your own site. Looks pretty wonderful! I like the painted covers, too. 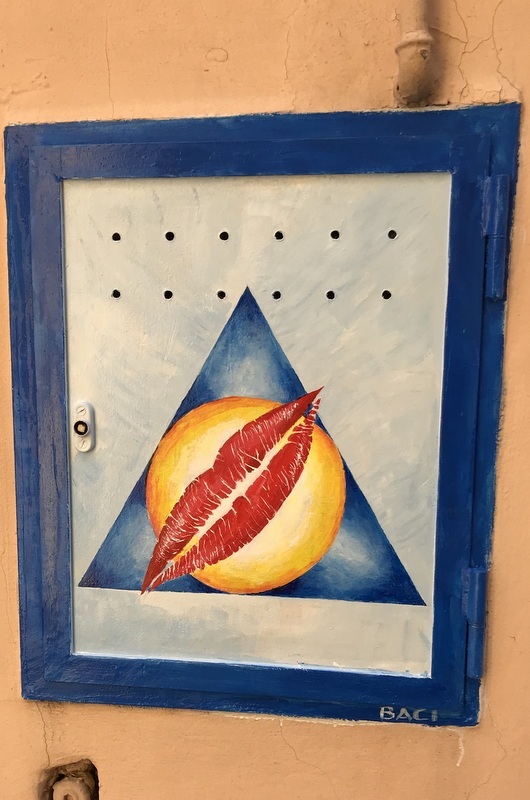 Are they commissioned or just “gifts” from the artists? 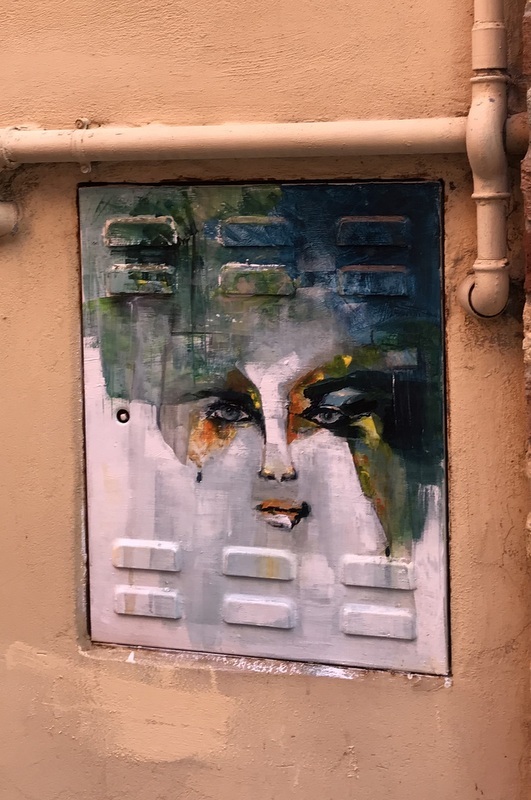 Are there rules about public art in Italy? I don’t really know about the covers. I’m guessing that they were just gifts from local artists. I have no idea about rules either in Italy or here. 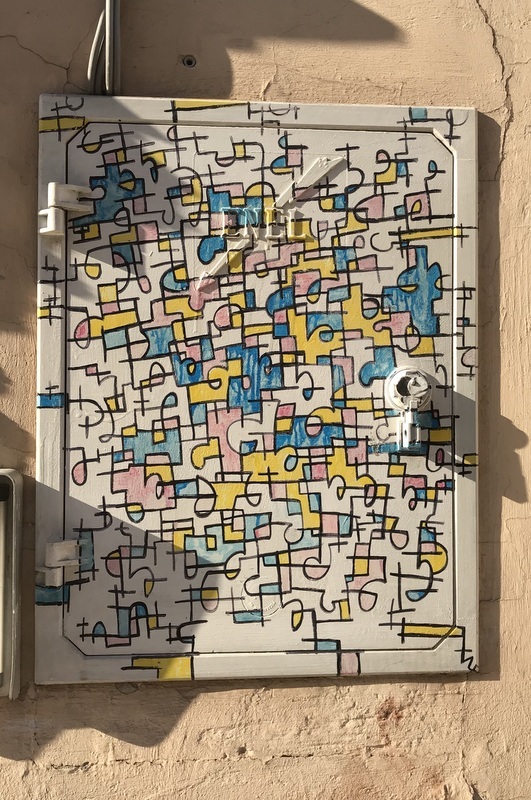 I’ve seem some pretty interesting paint jobs applied here and there in this country and assumed that as long as they weren’t vulgar or interfered with function then they were just left alone by whatever authorities. It depends on how long that you want to stay here. I mostly stay at a place on Via Orsoni which is much closer than San Lazaro. I’ll send you a private email with my contact information so we can discuss this further.